It's insane that I can sell my used gtx 1060 for more than I paid for it over a year ago. I also want ddr4 to drop again. I want to upgrade my ram to 16gb this year and also buy another SSD. But I refuse to pay more for both of those things than I did last year! SSD prices are higher now than they were a year ago? I thought that was the only thing going down now. DDR4 is insane! Would be like $200 to get 16gb. Do you have 2x4gb or 1x8gb? How many slots do you have? Tyler wrote: SSD prices are higher now than they were a year ago? I thought that was the only thing going down now. Also my 240gb SSD was $54. Most are more around $75 for that size. I understand that the speeds are slightly increased as well but I don't know if $20 is worth a marginal bump. Damn! You got a deal at $54. I would buy one if I saw it at that price. I'm sure the speed increase wouldn't even be noticed, especially compared to going from HDD to SSD. Good call on single 8gb. Will be much cheaper to just get another single 8gb this year. Cool that Nvidia said that, but it doesnt really matter. Newegg/Microcenter, etc don't know who is buying the cards or don't care. Yeah, there would be no realistic way of policing that. Not surprising. Did they have the tags as normal pricing instead of the inflated price seen elsewhere? Now I wish I would have looked closer. They weren't 50-100% inflated, but maybe 10-20? CrckrJack wrote: Source of the post. My Plex server was losing the 8tb drive when I plugged in another drive. I figured it was because the PSU wasn't strong enough to power all the drives so I just kept one of them unhooked. Finally decided to look into it. 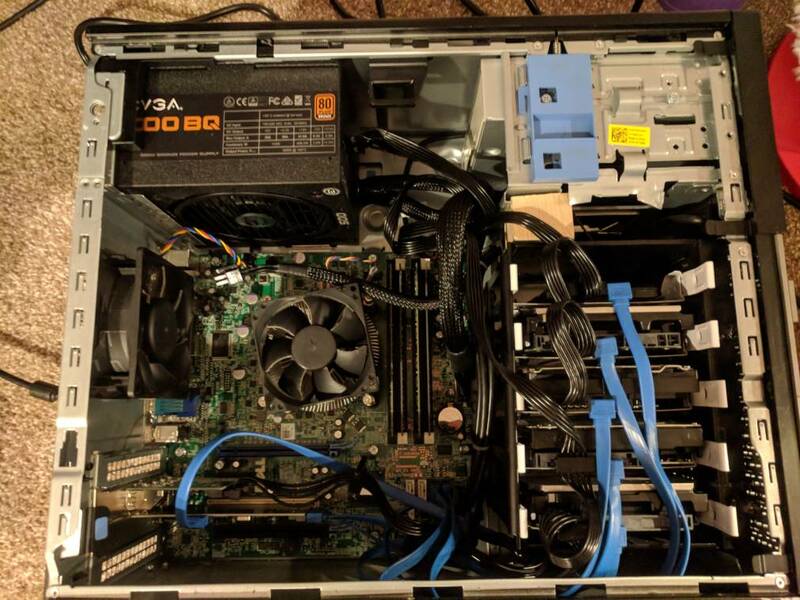 Server is only 240w. Just ordered a semi-modular 500w PSU for it so I can have all of the drives going again. First real PC part I've bought in awhile. I would like to upgrade my gaming desktop this year or early next year. New mobo, CPU, and RAM. I'm proud of my little server. This PC/case was made for 2 hard drives. I now have 1 SSD and 4 HDDs with room for at least one or 2 more. I had to add gut the old interals to fit the new hard drive rack. I added a new power supply tonight and a PCI card that added 4 more SATA ports. You're looking at 20TB of storage. Put a cheap SSD in the tank laptop I got from Wags. Night and day difference. All computers should have an SSD boot drive. I feel bad for my dad and not having one in his VR PC. I should upgrade that for him. Kyle, you got a 1070 ti?! You'll have the nicest card on the forum. Get a slick deal one? Tyler wrote: Source of the post Kyle, you got a 1070 ti?! You'll have the nicest card on the forum. Get a slick deal one?